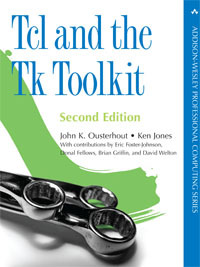 Tcl and the Tk Toolkit, Second Edition, is the fastest way for newcomers to master Tcl/Tk and is the most authoritative resource for experienced programmers seeking to gain from Tcl/Tk 8.5’s powerful enhancements. Written by Tcl/Tk creator John K. Ousterhout and top Tcl/Tk trainer Ken Jones, this updated volume provides the same extraordinary clarity and careful organization that made the first edition the world’s number one Tcl/Tk tutorial. Part I introduces Tcl/Tk through simple scripts that demonstrate its value and offer a flavor of the Tcl/Tk scripting experience. The authors then present detailed, practical guidance on every feature necessary to build effective, efficient production applications—including variables, expressions, strings, lists, dictionaries, control flow, procedures, namespaces, file and directory management, interprocess communication, error and exception handling, creating and using libraries, and more. Part II turns to the Tk extension and Tk 8.5’s new themed widgets, showing how to organize sophisticated user interface elements into modern GUI applications for Tcl. Part III presents incomparable coverage of Tcl’s C functions, which are used to create new commands and packages and to integrate Tcl with existing C software—thereby leveraging Tcl’s simplicity while accessing C libraries or executing performance-intensive tasks. Throughout, the authors illuminate all of Tcl/Tk 8.5’s newest, most powerful improvements. You’ll learn how to use new Starkits and Starpacks to distribute run-time environments and applications through a single file; how to take full advantage of the new virtual file system support to treat entities such as zip archives and HTTP sites as mountable file systems; and more. From basic syntax to simple Tcl commands, user interface development to C integration, this fully updated classic covers it all. Whether you’re using Tcl/Tk to automate system/network administration, streamline testing, control hardware, or even build desktop or Web applications, this is the one Tcl/Tk book you’ll always turn to for answers.